There are never enough minutes in a day. If only you could hire an assistant, limit your directions, and crank out more work, your photography business would benefit, right? Unfortunately, we’re not robots, so you’ll never be 100% productive. But online technologies could help you out! Today I’m going to tell you about a crazy-cool, online tool called IFTTT that will automate your online processes and save precious time for yourself. 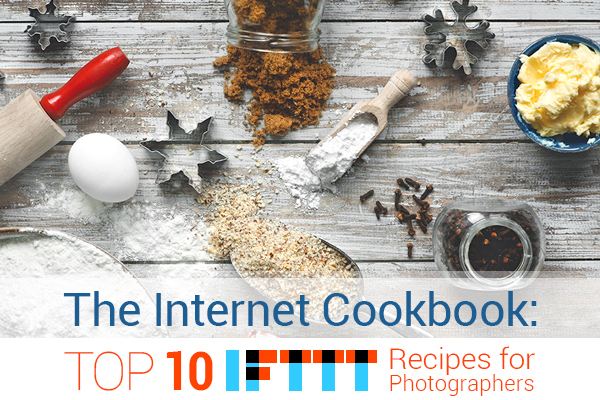 Moreover, here I collected the top 10 IFTTT recipes for photographers you can use. But first things first: If you’re not familiar with IFTTT yet, read the next paragraph. IFTTT (If This Then That) is a brilliant online tool that will enable you to connect two services and automate the sharing of information, notifications or processes which are useful in everyday online life. For instance, let’s say that you’re a photography fan who uses Instagram constantly day by day. You love taking photos with your handy mobile device, editing them with various editing apps, and sharing them out for everyone to see. IFTTT allows you to go a bit further. You can create a ‘recipe’ and connect your Instagram with Twitter, so that, once your new image appears on Instagram, it would be automatically shared on Twitter (or some other social media service). It’s a simple example of how IFTTT recipes work. A recipe you can use to cross-post from Instagram to Twitter natively. Once your new photo appears in Instagram, it posts on Twitter with images, automatically. This recipe will notify you once there is a new moon. It will be useful for those photographers who are going to shoot star trails. If you’re blogging about photography, it’s important to stay social and keep your fans updated about new stuff. This recipe can be used to post a tweet with an image once the new post is published on WordPress. You can do the same trick with your Facebook fun page and a Facebook profile page. Like Photodoto? Get the latest articles sent right to your email box! Every time a new post will be published, you will get an email notification. This awesome recipe will save all the photos you take with an iPhone to Google Drive at once, so you should not be worrying about losing the shots. Whenever you upload a new photo to Instagram, it will be backed up to Flickr automatically. It’s an amazing time-saver, isn’t it? Are you planning an outdoor photo shoot or going to the wedding session tomorrow? After activating this recipe, IFTTT will notify you via your iOS device that it could be raining tomorrow in some particular area. Save new and popular photos from 500px for later in your Pocket for inspiration with this recipe. You can select a particular category of the photographs that should be saved. There are a lot of ways to communicate with clients, and Gmail is one of them. This recipe will save all the emails you flag into your iOS reminder to be taken care of later. Whenever you add a new contact to your phone, it will be added to your Calendar automatically. It’s a new great way to add new events quickly and not forget about your next photo shoot! Which IFTTT recipe do you like best and are ready to use? Tons of new recipes are created every day, so don’t hesitate to share your own recipes with the curious Photodoto readership. Welcome to the comment field below! Stay tuned! More inspiring posts are on the way.